We have a strong Team of highly skilled and friendly people working at Copperfield Equine. The team at Copperfield Equine Therapy & Rehabilitation Center is at the core of the operation. Without strong backing from an influential and impressive array of health care professionals the Copperfield Center could not operate to the extremely high standards that it does. The Copperfield Equine Therapy Center, based in Co. Limerick, Ireland is owned and managed by Catherine Cooper. Catherine and her family have been involved in the horse racing industry for many years. Catherine trained extensively over many years and is extremely qualified in her field of work. She is passionate about her work and has dedicated over 24 years of her life to her continued growth, and research to improve and develop her skills in the use of Acupuncture, herbal supplements, balanced nutrition, to maintain health and well being, using a holistic and natural approach. She provides consultancy to horse owners, trainers, and managers. Catherine founded Copperfield Equine Therapy Center to cater for the needs of her many clients, gathered over years of excellence in the industry. 1976 Graduate of the University of Pennsylvania School of Veterinary Medicine. Welcome Ruth To Copperfield Equine Team. 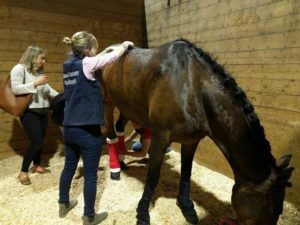 It is our honour and we are privileged to have someone as experienced and talented as Ruth who has an established business and vast experience in the treatment of the equine athlete, she will play an essential role in the whole holistic approach of the horses that have undergone the recovery protocol . Ruth qualified as a Chartered Physiotherapist from University College Dublin in 2008 and has worked extensively in the Health Service and private practice. Her keen interest in horses from a young age along with a background in competitive riding led her to complete a Post graduate Diploma in Veterinary Physiotherapy from the University of Liverpool. Ruth is currently involved in a research Masters from Liverpool on equine gait kinematics, hoping for publication in the near future. While there are many therapists in circulation, the highest qualification available is a PGDip/MSc in Veterinary Physiotherapy. Currently, Ruth is one of only four in the country with this level of education and experience. Chartered Physiotherapists in Veterinary Practice (CPVP) is a clinical interest group of the Irish Society of Chartered Physiotherapists (ISCP) of which Ruth is a member. The ISCP is the regulatory body for Chartered Physiotherapists in Ireland. This ensures that any treatment provided by a Chartered Veterinary Physiotherapist will be evidence based and clinically reasoned. Treatments include a full range of manual therapy, both joint and soft tissue mobilizations, electrotherapy, dry needling and exercise therapy. Ruth has a keen interest in the full holistic approach to maintaining health and wellness and works in conjunction with the veterinary surgeon, farrier and nutritionist to ensure optimal standards for the horse. Dr. Ken Hill, BSc Hons., DSM, PhD (Exercise Physiology and Nutrition), FRAM. Former director of Equine Research at the University of Limerick with special interest in training stress on horses, general health issues and performance nutrition. Hoof Sculpture – Dermot McCourt is a remedial equine podiatrist, who has worked and trained in Saudi Arabia and also with several AANHCP practioners in the United States. He started working with traditional farriery methods, but his career developed to working with severe foot problems – corrcting damage to return horses to being sound. Dermot specialises in trimming to alleviate and cure navicular syndrome and laminitis. “No horse no hoof ” It is essential to have good healthy and balanced feet in order to prevent other compensatory lameness. To read further into hoof management please read our article posted “The Negative effects of Shoeing” and on the essentials of the Hemodynamic Blood supply.